A discussion of the purpose of training with traditional weapons in Ba Gua Zhang and description of the characteristics of each weapon and its benefits. In Part 1: The Saber (Dao), Sword (Jian), Staff (Gan) and Seven Star Stick (Qi Xing Gun). Ba Gua Zhang training includes practice with traditional Chinese weapons, some of which are specific to the art of Ba Gua. Why train with traditional weapons? Some students resist weapons training because of the association of weapons with violence. Others complain that traditional weapons are not practical for modern self-defense. There is validity to these criticisms, but they are also a little simplistic. Weapons training is not only part of the culture of Chinese martial arts, but part of the learning method. 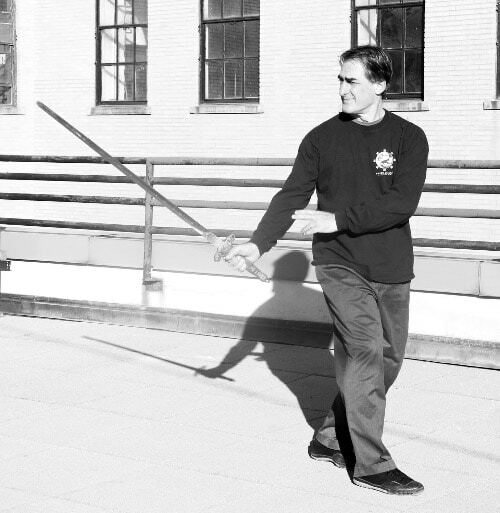 Many Ba Gua teachers like Master Gao Ji Wu feel that weapons training hones Shen Fa (“Body Methods”), the techniques and methods of maneuvering the body. Weapons add another dimension to the basic body movements, by forcing the practitioner to accommodate and adapt to the shape, weight and intrinsic nature of the weapon. The four classic Chinese weapons are the sword, saber, spear and staff. Although the sword and saber seem similar, they are in fact quite different, and each of these weapons requires specific energies, intention and body mechanics to wield it properly. The same is true of the two longer weapons, the spear and staff. The internal and external adjustments required to move from one weapon to another strengthen the body, mind, intention and spirit. These four weapons also provide the core movements and principles for understanding many of the other weapons. Weapons extend out beyond the body’s normal energy field and therefore require that we extend our intention and Qi outward in order to interact with the various edges, points and surfaces of each weapon. The spear in particular requires a fine-tuned intention that extends outward several feet to the tip of the spearhead. Weapons also have weight, so working with weapons increases functional strength. In this sense, weapons training is like a form of mild weight training, however rather than isolating individual muscles, or groups of muscles, the goal in working with weapons is to use the structure of the whole body to hold up and move the weapon. Each weapon develops different facets of functional strength. Weapons require us to understand how the momentum of the weapon influences our body movements. For example, the rooster knives are heavy and have many sharp edges. They must be held away from the body and the circular steps and rotation of the waist moves the weapon. At the same time “throwing” the weapon outward pulls the steps and aids waist rotation. Traditional weapons teach tactics. Each weapon uses different techniques and tactics. For self-defense purposes these techniques can easily be adapted to modern weapons or to improvised weapons. The different tactics learned through handling a weapon also trickle down to empty hand movements, and impart deeper understanding of Shen Fa. Hence the saying: “use your hands like a sword and the sword like your hands.” Weapons training also teaches us to adapt the core movements of Ba Gua Zhang to different situations, so that the mind and body stay open and flexible. Ba Gua Zhang weapons are often employed differently than weapons in other styles. Short weapons are used like long weapons and long weapons from time to time are used like short weapons. Rather then wielding weapons with the arms and shoulders, the Ba Gua practitioner keeps the weapon relatively still, holding it up with the aligned structure of the body, while letting the steps and the body carry the weapon through space. The Ba Gua Saber is a fearsome, powerful weapon that specializes in splitting, chopping, and slicing intermixed with curved thrusts. To some degree, it is the quintessential Ba Gua weapon, because its curved shape interacts well with the curved circular steps employed in Ba Gua. The saber has weight and cannot change direction quickly, so it stays relatively still while the body moves and changes. This creates an inherent deception. The saber seems to move, but in fact moves very little. The word Dao, actually means “knife.” The Ba Gua saber is not quite a sword and not quite a knife, so it employs the characteristic movements of both, seamlessly blending close quarter movements and applications with more long range movements and applications. The back of the blade of the saber is thick and can be used to deflect the opponent’s attacks. Additionally, one can place one’s hand on the back to deliver a controlled “two-handed” slice, or in preparation to reach out and control the opponent’s weapon hand. The handle is long, allowing for an occasional shift to a powerful two handed chopping stroke. One little known benefit of the saber is that it trains movements in which one grasps the opponent’s wrist in order to off-balance him or throw him. In this sense the Ba Gua saber is like a training partner. The use of the Jian is often compared to calligraphy, and the study of calligraphy is said to improve one’s swordsmanship. For all of these reasons, the Jian is considered the “gentleman’s weapon,” or an officer’s weapon in relation to the saber, which was a staple battlefield weapon. Some people say that the Jian is a more appropriate weapon for women because it relies less on ferocity and strength than the saber. There may be some truth to this, but anyone who has seen Michelle Yeoh wield a saber in Kung Fu cinema, might beg to differ. A little known benefit of the Jian is that it trains movements in which one escapes from a wrist grab while simultaneously taking the initiative. Just like the saber, working with the Jian is like having a training partner. 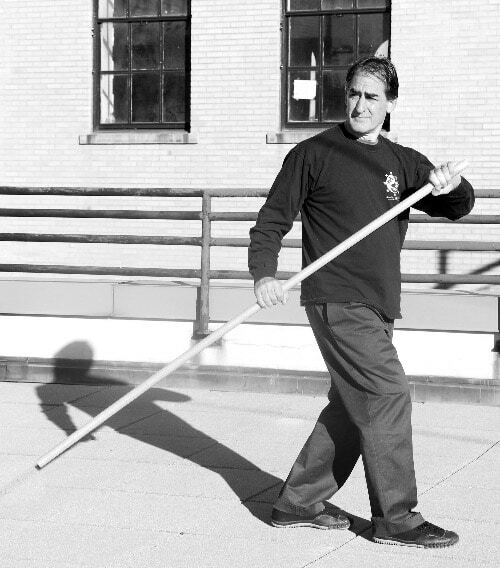 The Ba Gua Yin Yang Staff is a thick staff about six feet in length. The staff is a powerful weapon that can deliver bludgeoning blows or quick, deceptive thrusts. 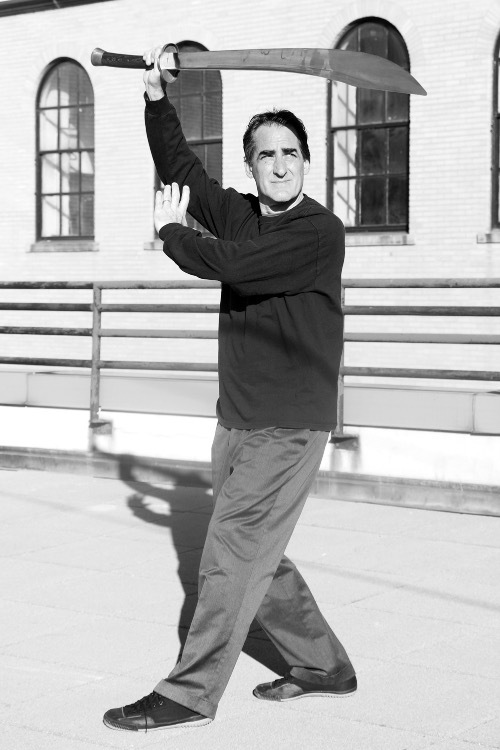 The staff mixes rotating, wrapping and enveloping movements with strikes and thrusts. Its weight and length require that the practitioner use fluid body actions to generate these movements. The staff, like all of the two-handed weapons, teaches the practitioner to connect both sides of the body, as they are effectively chained together through the connection of the hands to the staff. In order to freely strike with either end of the staff, one’s footwork and handwork must seamlessly link. This has many parallels with the hand forms and with the connection of intention, Qi and power. The Seven Star Stick is also called the Whip Stick (Bian Gun) or Heart High Stick (Xin Gun). It is essentially a walking stick used for centuries by Chinese people in the countryside, as both an essential tool and a weapon of self-defense. The Seven Star Stick is lighter and faster than the Ba Gua Staff. It is a highly flexible and adaptable weapon, with many modes of use. Because it can be used one-handed or two-handed, the Seven Star Stick includes movements of the Staff, Spear, Sword and Saber, as well as its own unique movements, blending them all together in a series of high speed changes. The Seven Star Stick actions also include, locks and throws as well as counters to grabs. 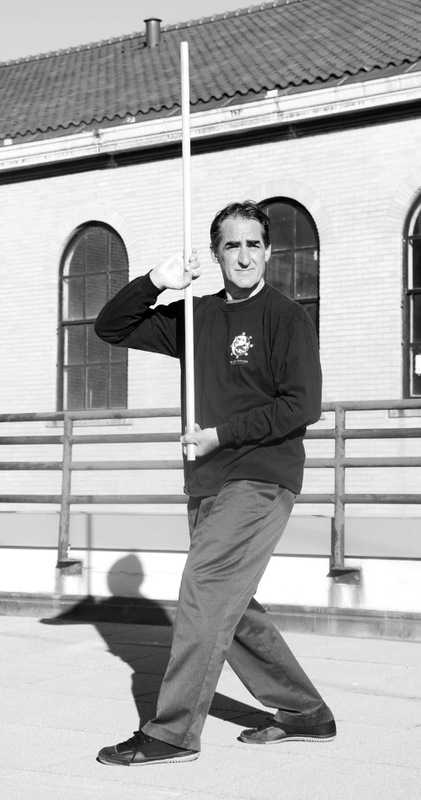 Like the Staff, the Seven Star Stick challenges one’s ability to tightly link hand and body changes with footwork.